The sleeping bag and mattress pad are just too confining, and the camp pillow is just too damn small. I slowly woke to the apprehension that I may have snored so badly that poor Stephanie was left wishing for bears, raccoons, or anything other than sharing a campsite with the likes of me. If that was the case, she refused to fess up. I tried to be quiet. I crawled out of my insect-free cocoon and stood in the cool damp morning air. I walked to a secluded spot and peed to my heart's content. 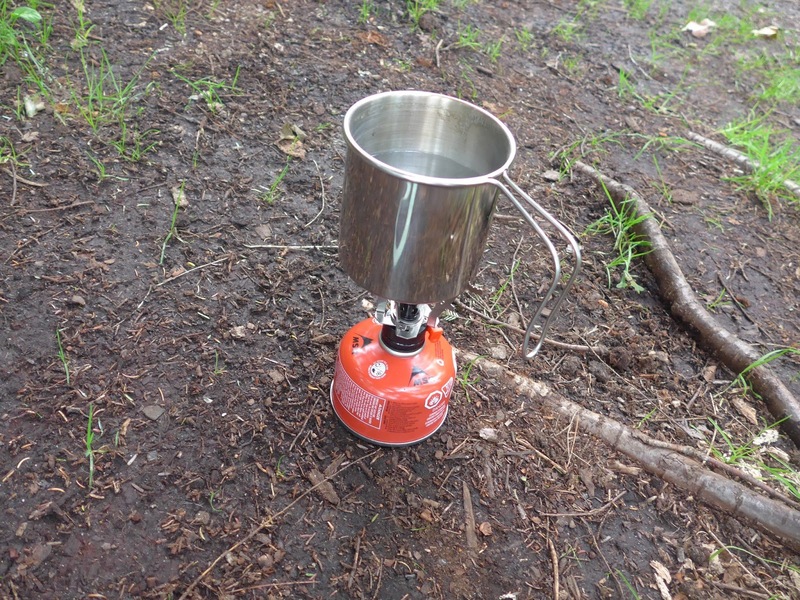 I walked out to the road to stretch my legs, and then crawled back into the tent and waited for Stephanie to stir. Once we were both officially awake, I offered to make coffee or tea. 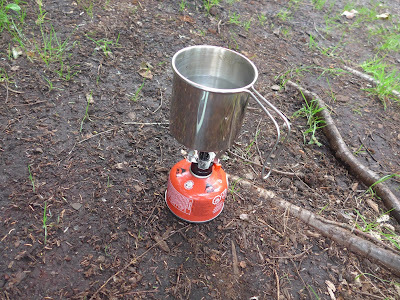 My ultra-light butane stove boiled the water in a jiffy. Stephanie opted for tea, I had coffee. There was no milk so both were served black. As I lay awake that morning before having ventured out, I had fantasized that there would be no bugs buzzing in the morning. There were fewer bugs, but not so few that lingering over hot beverages and pondering the meaning of life on the shores of picture-perfect Horseshoe Lake was ever an appealing option. We did the only rational thing. 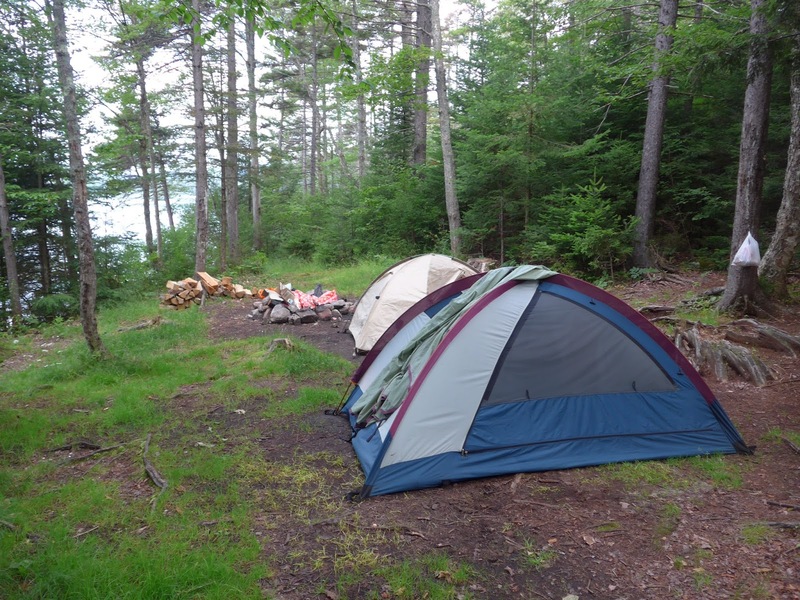 We pulled on the armour, struck camp, and hit the road again. Now, I have a hard time passing up a decent breakfast, so finding one became the first order of business. Fortunately Stephanie didn't object to the agenda. We saw a few prospects here and there as we rode north on route 30, but on inspection, nothing panned out. 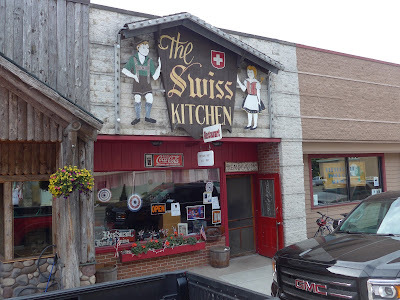 When we rode into the village of Tupper Lake, at the top end of Tupper Lake, we had some options, and settled on the Swiss Kitchen restaurant. It was a suitably homey place, with booths, locals enjoying breakfasts and chatter, and the kind of friendly waitress you expect when you imagine a small-town place like this. We ordered coffee, bacon and eggs, and enjoyed the meal down to the last bite. Did I mention there were no bugs? We picked up our conversation pretty much where we had left off when sleep got the better of us the night before. I promised at the outset to report every intimate detail of our two-day adventure. 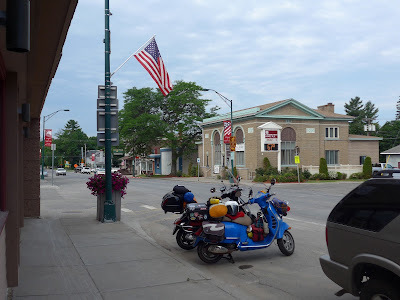 If you've been following along, you may have noticed that, aside from riding, sleeping, and swatting armies of bugs, we yacked, blabbed, chatted, jabbered, gabbed, yada-yada-yada'd, and otherwise spent considerable time chewing the fat. And yet, promises aside, I haven't said boo about the actual content of our conversations. I'll eventually make good on the undertaking to reveal all, I swear. But not quite yet. At one point during our feast, Steve, Tom, Craig and Ron walked in for breakfast. Bikers. The tip offs were armour and some hi-viz bits. But we didn't know who they were until quite a bit later. Stephanie picked up the tab for breakfast because the Swiss Kitchen didn't take plastic, and I hadn't managed to find an ATM yet. Fear not, I made it up to her later on. With our tummies full, we got back on the Vespas and made tracks. 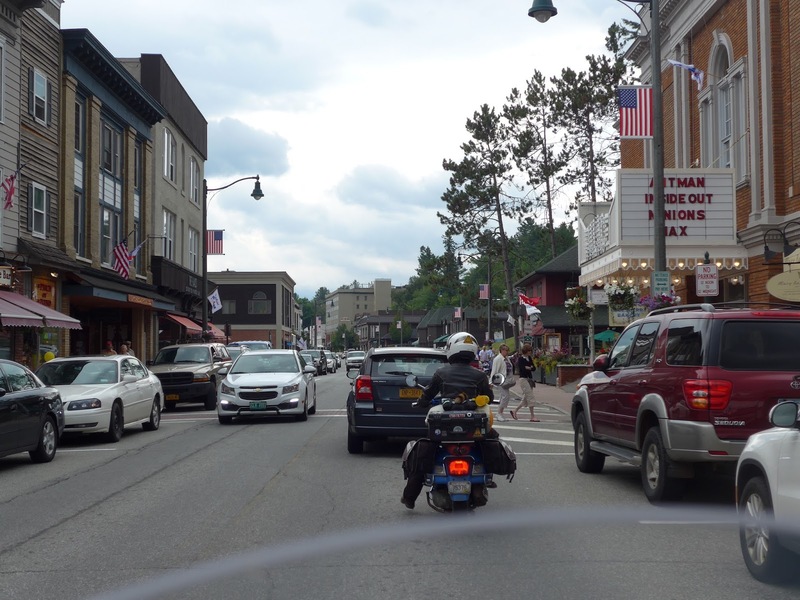 Our major destination was Lake Placid. 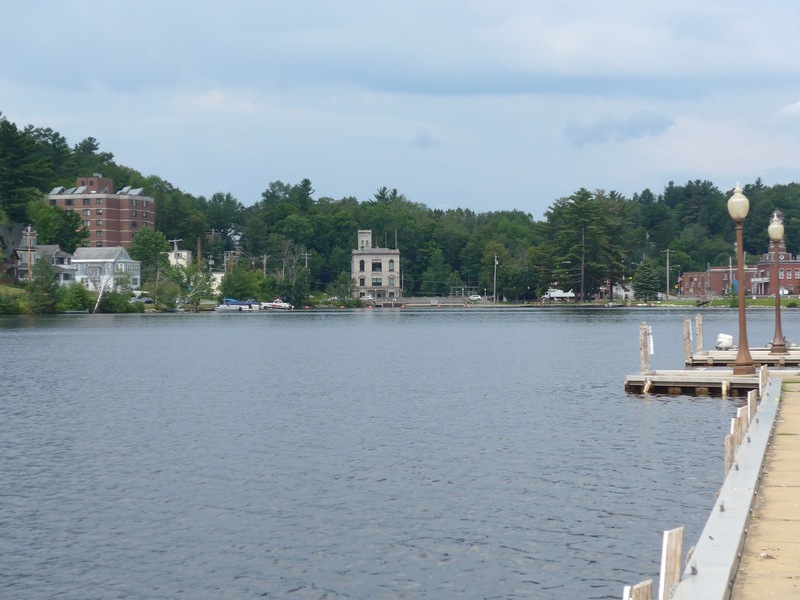 Without doubt Lake Placid is the crown jewel of the Adirondacks. Its claim to fame is without question the 1932 and 1980 winter Olympics, but it's also just a really, really pretty little country town. 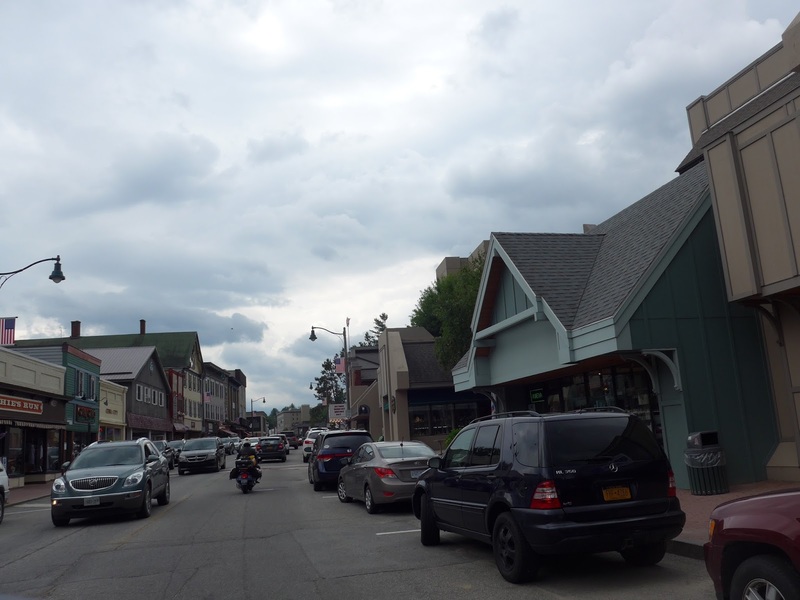 Along the way we stopped to stretch our legs in Saranac Lake, another pretty little Adirondack town. In the fullness of time, we came to Lake Placid. On the way downtown we passed a spot where we were fairly compelled to stop for obligatory snapshots. We cruised slowly through the centre of town in the same fashion as cruising down A1A in Fort Lauderdale, past the five corners intersection in Ogunquit, along the main road in North Conway, the outlet mall strip in Kittery, Pike Place in Seattle, or St-Paul street in Montreal. The laid back pace, the throng of strolling tourists, and the rubbernecking motorists, all conspire to create that langorous slow crawl I just love. 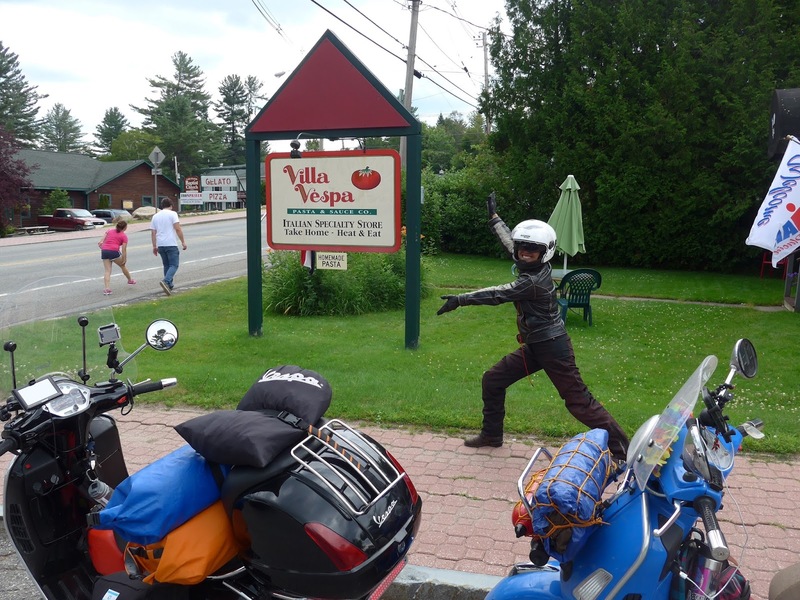 We parked the Vespas towards the end of the main strip and set off on foot to visit the town. I also needed to find an ATM. We would eventually need to grab a bite to eat as well. Enter Steve, Tom, Craig and Ron. As we strolled and talked (I know, I know, how much could possibly be left to say? 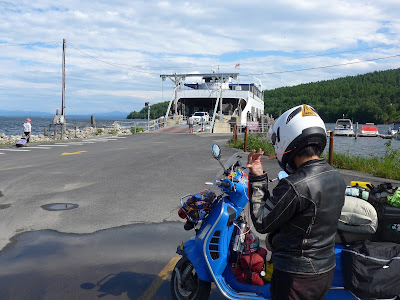 ), and checked out the sights and a few boutiques, and read menus, and Stephanie checked the schedule for the Port Kent, New York to Burlington, Vermont ferry, we were pulled from our blissful stroll by Craig. "Hi there! are those your scooters parked down the street?" "Yes they are" one of us politely replied. Craig couldn't quite understand (who could blame him) how two Vespa scooters, one with Quebec plates, one with Rhode Island plates, and clearly part of a team just because of the similar ways they were equipped for an expedition, came to be parked in Lake Placid. Imagine his surprise when he heard Stephanie's story. Imagine our surprise when Craig introduced his buddies Steve, Tom and Ron. Once we saw Steve and Tom we understood not only that they were fellow riders, but they were the same crew who walked into the Swiss Kitchen in Tupper Lake. Adding to the element of surprise we learned that they all hailed from Toronto. Canadians are the nicest people, don't you know? 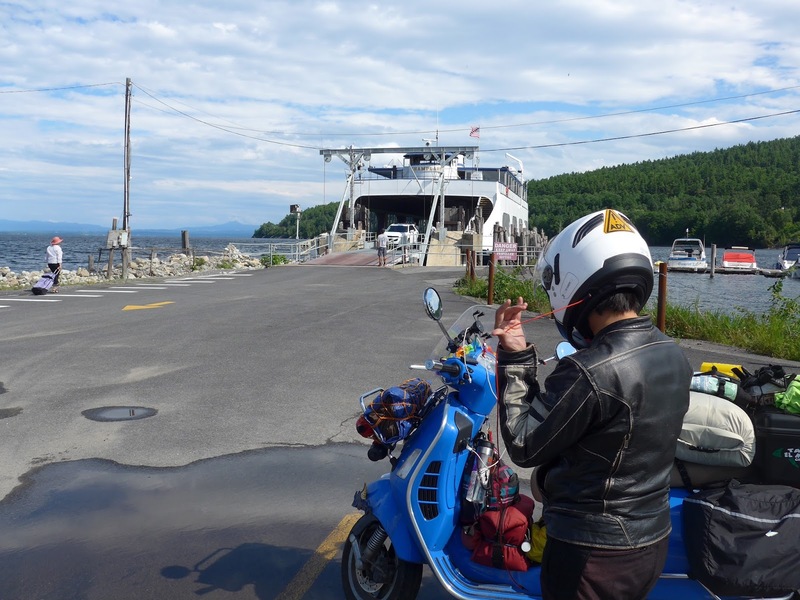 It turned out that we were headed the same way, to the Port Kent ferry terminal on Lake Champlain. They suggested Stephanie and I ride up Whiteface Mountain to visit the place called the Castle. Great views and a coffee shop where we could grab that bite we were planning. After our encounter with the boys, we wished them safe travels, and Stephanie looked forward to seeing them on the ferry later in the day, if the timing aligned. As all this was happening the skies were turning gray. Not storm gray, not rain gray, just gray-ish. We rolled out of Lake Placid on Route 86 with an eye out for the road leading to the Castle on Whiteface. We never got there. Fate intervened. 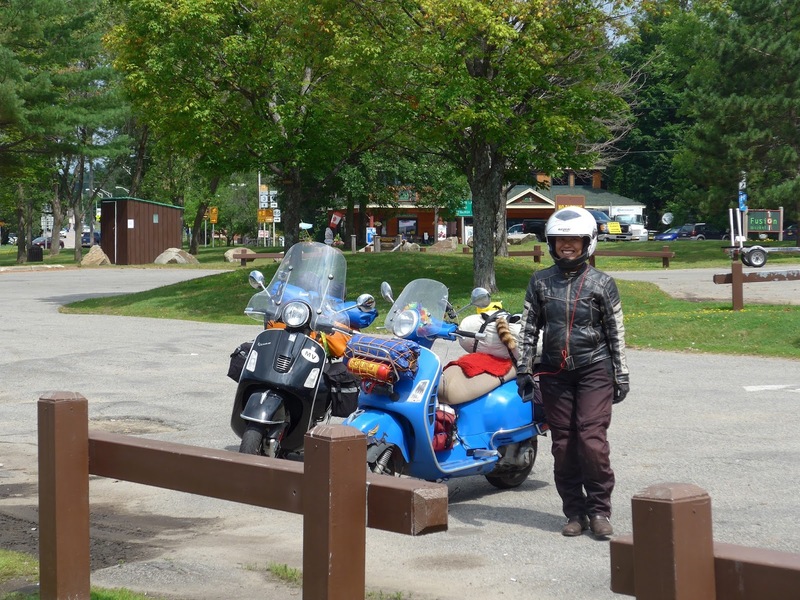 Not long after leaving Lake Placid, Stephanie pulled over on a gravel turnout. When I rode up next to her, she had a very focused and concerned look about her. It clearly spelled trouble. Before I could manage much more than "What's up?" Stephanie was off her bike and rummaging through a saddlebag. She was terse. 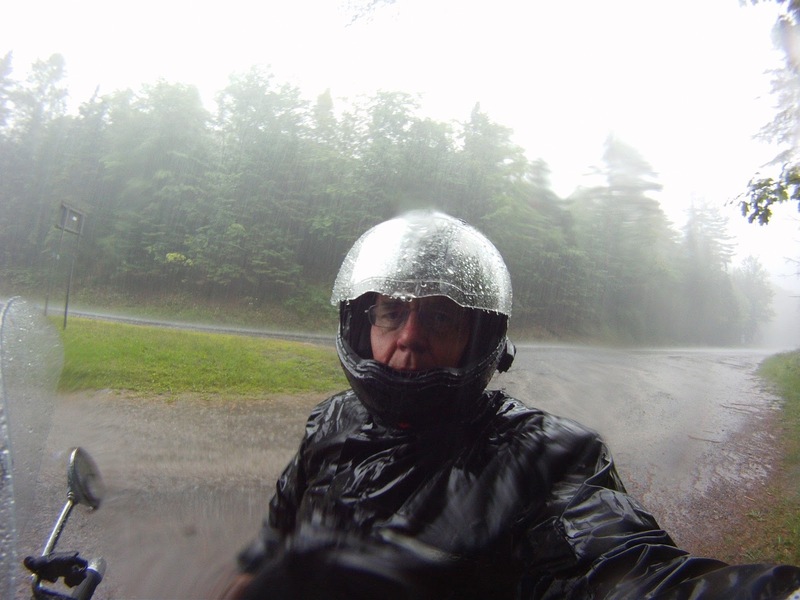 "Get your rain gear on, we're about to get dumped on... my riding pants aren't waterproof... I need to find shelter... catch up with me a mile or so down the road..." and with that intensely brief admonition barely past her lips, she hopped on her Vespa and sped off down the highway. All right then... I popped the seat and got my rain jacket out. By the time I had one arm in a sleeve, huge drops began to fall. No sooner had I zipped up, and it was pouring. By the time I got rolling, a major squall was well underway. Visibility was so low due to the volume of water raining down, that the traffic had slowed to a crawl with four-ways flashing. 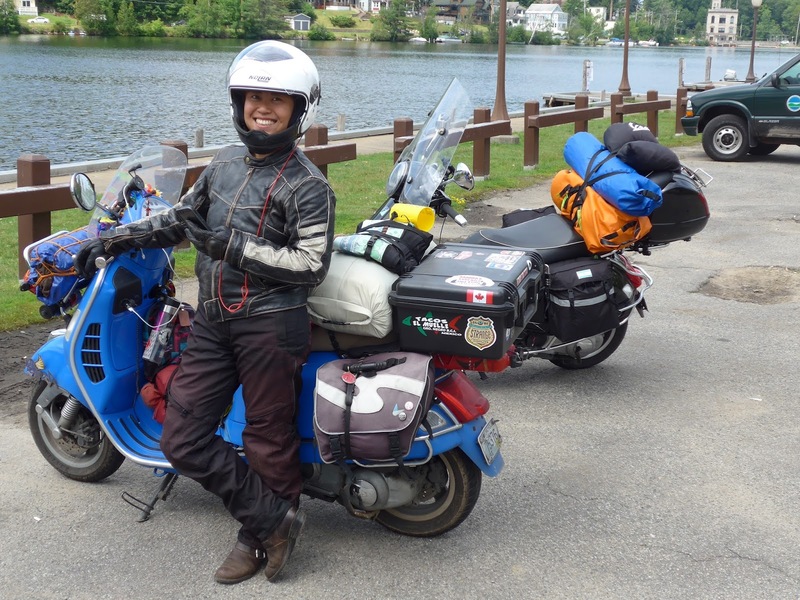 Now motorcycle travel done well is a queer thing. With brand new Revit Enterprise armoured pants, Icon Patrol waterproof boots, a Teknic rain overjacket, and my trusty Nolan N104 helmet, aside from my nice Tucano Urbano mesh gloves and the ocasional drop that invaded my visor, I was dry in the deluge. A couple of miles downstream, at another turnout, I spied Stephanie sheltering on the edge of the woods under her tarp rigged over the bike as best she could. There were a couple of cars and a truck in the turnout as well. The drivers had judged it better to pull over to wait out the storm. I made a cautious U-turn, entered the turnout and parked next to Stephanie where we waited out the worst of the storm. We couldn't easily communicate, so I took pictures and a brief video to relieve the boredom, and record our plight for posterity. All the while, there was one question burning in my brain. "How the heck... by what black art... did Stephanie learn of impending cataclysm? I mean within minutes of the onslaugth, literally! Holy cow!" Storms like that can't last that long. 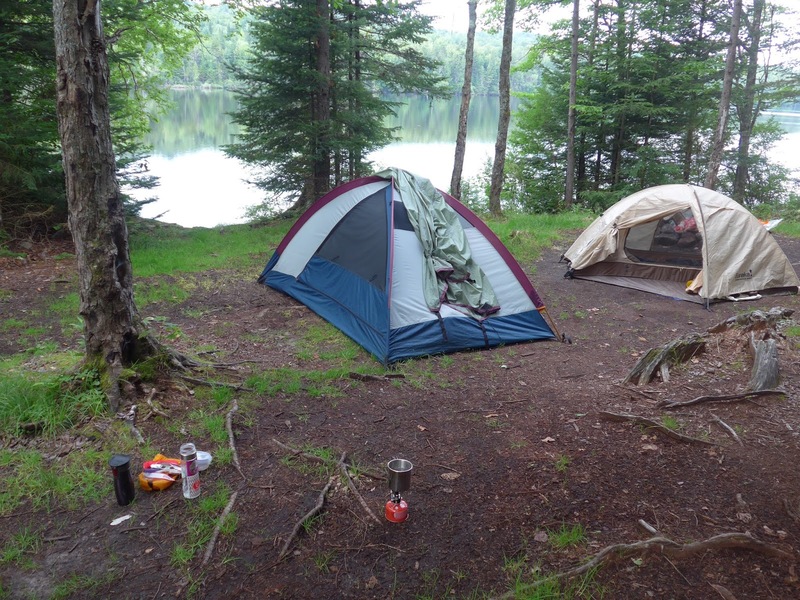 When the flood turned to normal-ish rainfall, Stephanie stowed her tarp and off we went. A couple of miles further down the road we stumbled on the Hungry Trout restaurant. We pulled into the parking lot. Stephanie wanted to make the 4:30 ferry, and given the time, suggested that we grab a bite to eat at this serendipitous spot, and forego the Castle. 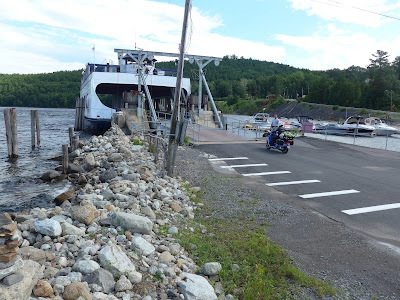 It was a reasonable suggestion, I was hungry, and it meant that we could maintain a leisurely pace without worrying about Stephanie making her date with the ferry. When I pulled off my Tucano Urbano summer riding gloves (a gift to myself I purchased in Rome a few years back) my hands were... BLUE!!! I mean seriously blue. Stephanie thought it was a hoot (mainly because her hands weren't blue). No amount of scrubbing with mud and sand did more than exfoliate my blue hands. The liquid soap in the Hungry Trout's restroom left my hands soft, supple, fragrant... and BLUE! I felt like a bank robber ambushed by a bandit-pack bundle of booby-trapped hundred dollar bills. Thankfully the Hungry Trout doesn't discriminate against aliens or bank robbers, and we were seated in the restaurant, and served no less. Guess what we did then? Yup, more chatter. "How in heaven's name did you know that was going to happen?" I stammered. "Noah" Stephanie said rather matter-of-factly. "You're related to Noah??" (which I suppose most of us are, in a Darwinian way). "No silly... NOAA, the National Oceanic and Atmospheric Administration. NOAA.gov. I have the NOAA app on my iPhone, I was tracking the weather system, I knew the intensity, and pretty much when we were going to get hit." Wow. That's how smart and connected you have to be to survive fourteen months on the road solo on a Vespa, visiting all forty-eight of the contiguous states in America. Stephanie learned a lot about life in her thirty young years, and had much to share. Hence all the jaw flapping and chin-wagging we had been up to at every opportunity. 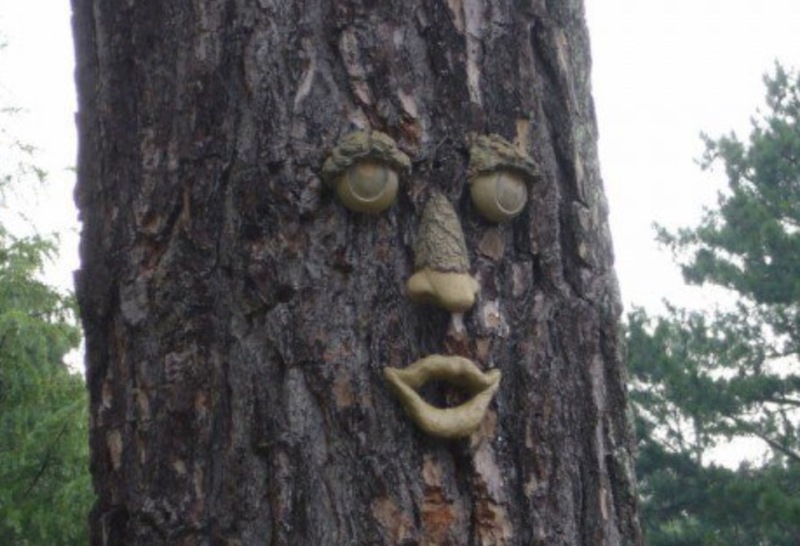 My only regret of my two day adventure is that I didn't spend $20 in the Hungry Trout's gift shop on a tree-face. How short-sighted. The big pine tree on our front lawn so deserves a creepy smirk. 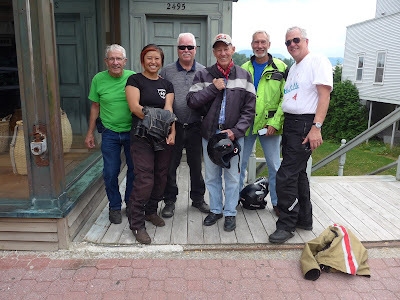 By far the very best section of motorcycle touring road was still to come. 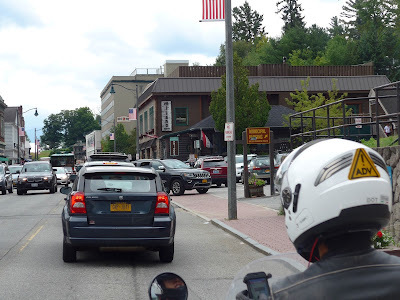 The combination of Route 86 and Route 9N from Lake Placid to Port Kent was nothing short of wondrous. 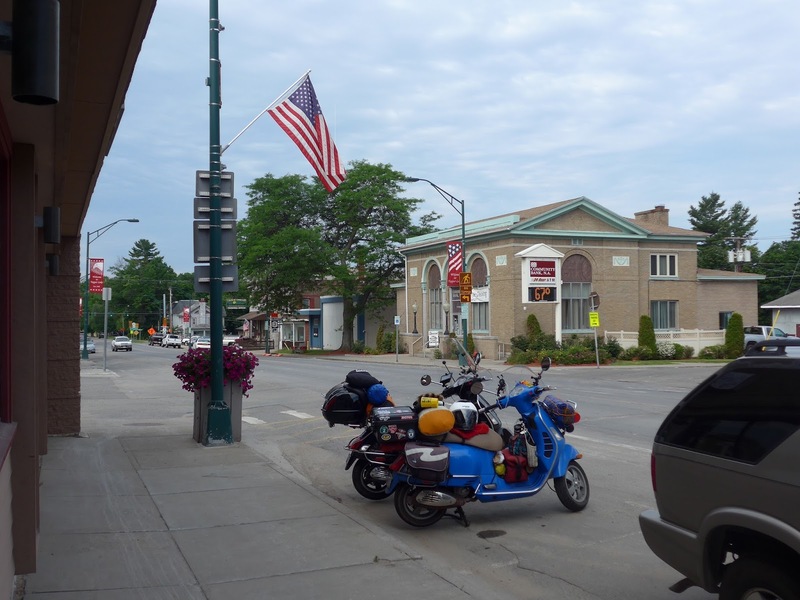 It's a long sinuous downhill run, often following the picturesque Ausable river, with a section toward the end of Route 9N where the bridge takes the road over Ausable Chasm. 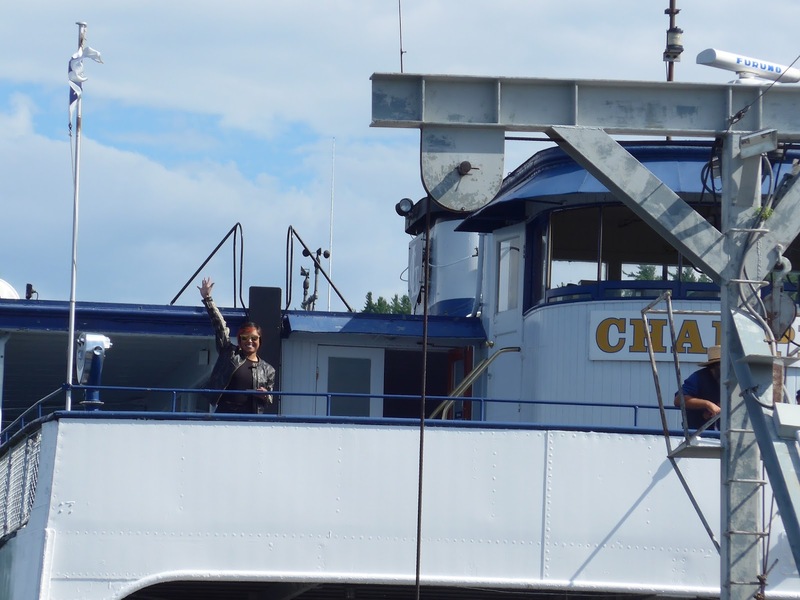 Far too soon, my little tiny slice of Stephanie's incredible America-wide journey came to an end on the shores of Lake Champlain. I set her free and on her way, left only with incredible memories that money simply won't buy. Set yourself free! Hit the road Jack! Stay-tuned. There's still a little more to come. I've really been enjoying the 2015 Blogger to Blogger Tour installments, David. Good stuff indeed. You know, shifties do okay at slow speeds, but nothing beats an automatic scooter for the laid back pace, throngs of strolling tourists, and rubbernecking motorists that can conspire to create a languorous slow crawl... True vehicles for contemplation, those scoots. Hmmm, Lake Placid. May be time for a return visit. Sounds like a great meet-up. That's what makes scooters unbeatable in the city as a commuter vehicle, that and maneuverability in heavy traffic. Dave the nice thing about Lake Placid is that it's so accessible, just a hop across the border. Starving mosquitos... swatted without mercy. Sounds both trivial and cruel, doesn't it. I show many other bugs mercy, but house flies and mosquitos I kill with impunity. Incredible - it was only two days? What a great narrative, David. I love the details, even the bits who are usually t.m.i. Imagine what your story would be if you were to go on an epic multi day ride yourself... I'd say that would be novel size! 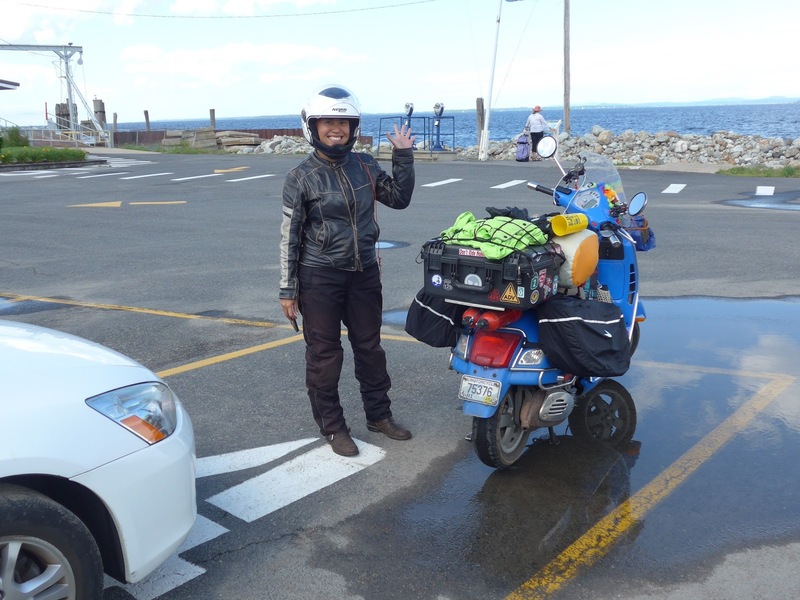 Ah Karen, if it were just me, I would have gladly ridden to Lubec with Stephanie. Alas, I needed to take others into consideration, so I had no choice but to wring as much as possible out of a mere 36 hours. Sonja, as we bloggers know all too well, if it takes an hour to live, it takes multiples of that to tell a decent story worth reading. 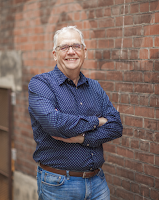 In my life as a corporate secretary, the in-joke is that while the account of a meeting is referred to as minutes, it takes hours and hours to write the minutes. Same thing applies to blogging. A life well-lived pretty much commands a novel, I think. I loved reading this and can't believe you did all that in just two days. What a great time! Katy it was indeed a wonderful two-day experience.